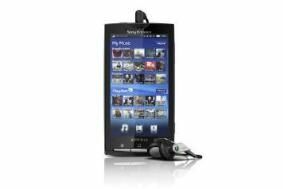 Sony Ericsson launches its first Android multimedia phone the Xperia X10 | What Hi-Fi? The company hopes the new look interface will give users an "unrivalled integration of social media services and a rich graphical user interface". Users will be able to download applications from both the PlayNow and Android markets, allowing access to apps for the likes of Facebook and Twitter. The phone has an 8.1-megapixel camera, a 4in colour touchscreen and an 854 x 480 resolution screen. There's a microSD card slot and an 8GB card will be bundled. The Xperia X10 will be compatible with 2nd and 3rd generation networks as well as HSPA and Wi-Fi. Sony Ericsson is also introducing a new wireless stereo headset with FM Radio, the MW600. Featuring advanced Bluetooth™ technology and a built-in FM radio and an OLED display.